Cutting winter firewood is not easy. In fact, it's actually the hardest and least effective time of year to cut firewood due to weather conditions and the inability to season the wood before use. However, anyone who heats with wood has probably run out of firewood at one time or another. It seems like no matter how much you prepare and how much extra firewood you think you have, sometimes you just run out. A good rule of thumb when cutting firewood is to cut the amount of wood you estimate you will need for the entire year. Then, cut about 30 percent more wood to allow for unexpected weather conditions and other surprises. So what can you do when you run out of firewood in January or February when there's still snow on the ground? Here's a few dangers and suggestions for finding firewood in the winter. There are two main factors that make cutting firewood in the winter difficult…..snow and the lack of drying time to season the wood before use. Felling a tree is dangerous enough in perfect weather conditions. With snow on the ground it reduces your traction and hinders your movement. It's tough to move out of the way of a falling tree in knee deep snow. Plus, once the tree is on the ground it's now buried in the snow which makes cutting it up even harder. Another big disadvantage of cutting winter firewood is the inability to season the wood before using it. You can't just go out and cut down a live tree, split it up and expect it to burn. The first year using our outdoor wood furnace we ran out of firewood in February. Not knowing any better I spent all day (and a lot of energy) cutting up a maple tree and dragging the wood out on a sled in a desperate attempt to keep our fire going. Since the tree was alive, the wet wood did not burn even in the outdoor wood furnace. I learned a valuable lesson that first year…….never run out of dry firewood! This basically limits you to cutting only dead standing trees in the winter if you want to burn the wood immediately…….which is probably the case if your out cutting firewood in sub zero temperatures. 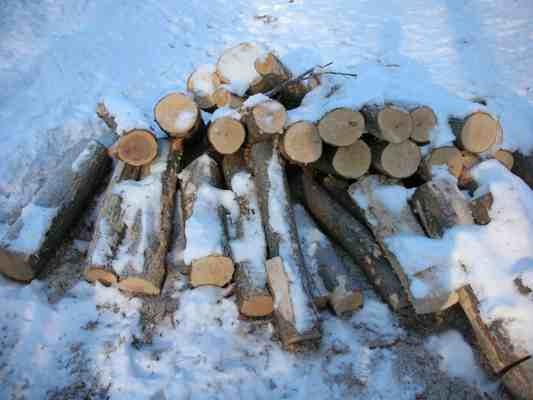 Cutting firewood in the winter can be done, it's just harder……..a lot harder. To make things easier, take the time to cut a little extra firewood this year when the weather conditions better, preferably in the spring. The cool spring temperatures are great for cutting wood and the hot summer months are perfect for seasoning it. If you do run out of firewood, sometimes it's easier to just pay the money and buy enough seasoned wood to get you though the rest of the year, or at least until the snow melts off.